Over 330 high schools play football in Kansas and Sports in Kansas has announced its All Non-Senior Team from the 2018 season. Final selections are picked by Chet Kuplen of Sports in Kansas, along with input from SIK contributors Ben Mitchum (Central/Western Kansas), Sean Boston (Wichita), Kyle Odermann (Kansas City), with additional input from several media members and coaches across the state. This is not a list based on recruiting, to be eligible for the list players had to be a freshman, sophomore or junior during the 2018 football season (Graduation years: 2022,2021, 2020). ATTENTION PARENTS/ATHLETES: Players on list are elgible for a All Non-Senior Team or All-Non Senior Team honorable mention patch for letter jacket, we are the only place with our logo on them. email Chet Kuplen at the following email address to order: sportsinkansas@gmail.com to order. QB - Reagan Jones, Wichita Northwest, 6-1 180 Jr.
QB - Malik Berry, Free State, 6-3 215 Jr.
QB - Quinn Buessing, Axtell, 6-1 175 Jr.
QB – Gabe Garber Sabetha, 5-10 175 Jr.
QB- Kyler Semrad, Goddard, 6-1 190 Soph. RB - Tank Young, Aquinas, 5-7 165 Soph. RB - Brison Cobbins, Miege, 5-7 160 Jr.
RB - Ky Thomas, Topeka, 5-11 195 Jr.
RB - Caden Cox, Maize, 5-10 195 Jr.
RB - Tre Washington, Derby, 5-10 195 Jr.
RB - Wyatt Pedigo, Hoisington, 6-1 205 Jr.
TE - Quinton Stewart, Salina Central, 6-4 225 Jr.
WR - Alex Schremmer, Great Bend, 5-10 165 Jr.
WR - David Brown, Blue Valley West, 6-1 170 Jr.
WR - Phillippe Wesley, Miege, 5-11 165 Soph. WR - Preven Christon, Maize, 6-0 175 Jr.
OL - Turner Corcoran, Free State, 6-6 285 Jr.
OL - Max Kalny, St. James Academy, 6-6 285 Jr.
OL - Refugio Chairez, Garden City, 6-1 305 Jr.
OL - Jaedon Roberts, Aquinas, 6-6 330 Soph. OL - Cody Fayette, Maize South, 6-6 290 Jr.
OL- Hayden Pauls, Emporia, 6-5 260 Jr.
OL- Javon Wheeler, Wichita Northwest, 5-10 215 Soph. OL - Brayden White, Louisburg, 6-4 270 Jr.
ATH - Arland Bruce IV, Olathe North, 5-10 180 Soph. ATH - Teven McKelvey, Gardner-Edgerton 6-1 180 Jr.
ATH - Adam Albertini, St. Paul, 5-9 165 Jr.
KR/PR - Taybor Vetter, Wamego, 5-9 160 Jr.
KR/PR - Conor Haviland, Humboldt, 6-1 175 Jr.
K - David Kemp, Andover, 5-8 170 Soph. DL - Nate Matlack, Olathe East, 6-4 210 Jr.
DL - Matthew Roberts, Aquinas, 6-2 210 Jr.
DL- Zeke Howell, Goddard, 5-11 175 Jr.
DL - Pene Saili, Jefferson West, 6-1 225 Soph. DL - Lovette Epelle, Free State, 6-1 235 Jr.
DL - Hadley Panzer, Lakin, 6-4 290 Jr.
DL - Zach Saville, Maize South, 6-2 295 Jr.
DL - Reid Spachman, Blue Valley North, 6-3 210 Jr.
DL - Tyler Dorsey, Derby, 6-2 265, Jr.
LB - Mason Thrash, McPherson, 6-2 200 Jr.
LB - Tony Lunson, Olathe South, 5-10 195 Jr.
LB - Jared Casey, Plainville, 6-0 220 Jr.
LB - Cade Lautt, St. James Academy, 5-10 220 Jr.
LB - Dhimani Butler, Goddard, 5-11 220 Jr.
LB - Tim Foster, Blue Valley North, 6-2 210 Jr.
DB - Kordan Harris, Aquinas, 5-9 165 Jr.
DB - Rishi Rattan, Miege, 5-10 165 Jr.
DB - Dalton Miller, Great Bend, 6-0 175 Jr.
DB - Beau Palmer, Blue Valley, 6-2 195 Jr.
DB - Trevion Mitchell, Maize South, 5-10 165 Jr.
DB- Daquan Johnson, Parsons, 6-0 155 Jr.
DB - Ty'Quez Agnew-Whitten, Miege, 6-1 205 Jr.
P - Dominik Stadlman, Blue Valley Southwest, 6-3 175 Jr.
QB - Jack Moellers, St. James Academy, 6-1 205 Jr.
QB - Jackson Kavanagh, Salina Central, 6-1 180 Jr.
QB- Ty Black, SM Northwest, 6-1 175 Soph. QB- Garrett Harmison, Riley Co., 6-0 160 Jr.
RB - Atreyau Hornbeak, Marysville, 6-1 195 Jr.
RB - Eli Salmans, Hodgeman County, 6-2 205 Jr.
RB- Andrew Nehrbass, Olathe South, 5-10 180 Soph. RB- Joe Williams, Wichita North, 5-9 160 Jr.
RB- Bryce Krone, Bonner Springs, 6-1 215 Jr.
RB - Tony Friends III, Shawnee Mission East, 5-7 170 Jr.
RB - Tayezahn Crough, Hutchinson, 6-0 175 Jr.
RB - Scott Grider, Halstead, 5-10 185 Jr.
RB - Jaylin Richardson, KC Schlagle, 6-0 195 Jr.
RB- Tate Seabolt, Cimarron, 5-7 170 Soph. TE - Blake Mitchell, Goddard, 6-3 200 Jr.
TE- Cody Stufflebean, McPherson, 6-4 215 Jr.
WR - Davin Simms, Derby, 6-0 170 Soph. WR- Tyson Struber, Canton Galva, 6-2 175 Fr. 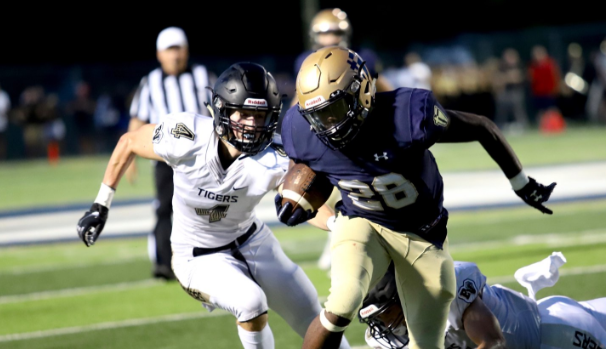 WR - Connor DeLong, Olathe West, 6-3 180 Jr.
WR - Xavier Bell, Andover Central, 6-4 175 Jr.
WR- Zion Jones, Wichita Northwest, 6-0 165 Jr.
WR - Kale Schroeder, Sedgwick, 5-10 175 Jr.
WR - Brock West, Maranatha Academy, 6-2 175 Jr.
OL - Christian Mozingo, Aquinas, 6-4 325 Jr.
OL - Matthew Beyer, Mulvane, 6-4 280 Jr.
OL - Cole Sample, Tonganoxie, 6-3 285 Jr.
OL - Talor Warner, Gardner-Edgerton, 6-4 250 Jr.
OL- Rylan Miller, SM North, 6-4 230 Jr.
OL- Kel Stroud, Chapman, 6-5 265 Jr.
OL- Jonah Weber, Hanover, 6-4 250 Jr.
ATH - Syris Dunlap, Liberal, 5-9 160 Jr.
ATH- Hayden Brown, Hays, 5-10 170 Jr.
ATH- Calvin Stapp, Colby, 5-10 180 Jr.
KR/PR- Darrien Holloway, Osborne, 5-11 170 Jr.
KR/PR- Dariq Williams, Parsons, 6-0 170 Jr.
K - Gage Girk, South Central, 5-9 150 Jr.
DL - Carson Williams, Jackson Heights, 6-2 225 Jr.
DL - Kauli Saili, Jefferson West, 5-11 290 Jr.
DL- Peyton Reeves, Aquinas, 6-2 260 Jr.
DL - Ethan Kramer, Mill Valley, 5-11 240 Soph. DL - Caleb Haggard, Labette County, 6-3 235 Jr.
DL- Connor Hall, Andover, 6-6 215 Jr.
LB - Mac Brand, Andale, 5-9 180 Jr.
LB - Garron Champoux, Marysville, 5-11 190 Jr.
LB - Ashton Ngo, Andover, 5-10 190 Soph. LB - Isaac Hilt, Wellington, 5-11 200 Jr.
LB - Mikey Welsh, Miege, 6-0 200 Jr.
LB- Garrett Dalinghaus, Frankfort, 6-0 170 Jr.
LB - Koy Kenny, Ulysses, 6-1 190 Soph. DB - Dallas Williams, De Soto, 5-11 155 Jr.
DB- Trey Krause, Olathe West, 6-1 170 Soph. DB- Kamble Haverkamp, Centralia, 5-11 160 Jr.
DB - Jordan Finnesy, Plainville, 6-0 170 Jr.
DB - Scotti Easter, Andale, 6-1 175 Jr.
DB - Davonte Pritchard, Gardner-Edgerton, 6-0 185 Soph. DB - Nalell Kapten, Goddard, 5-11 175 Jr.
DB- Landon Everett, Canton Galva, 5-10 160 Jr.
P – Madden Rutherford, Louisburg, 6-4 190 Jr.